It was Charles Ardai, art director and publisher of the Hard Case Crime novels. The conversation went something like this. So began one of my most challenging, yet fun, paintings. I like working with Charles as we both visualize covers in very similar ways. We almost get the same images popping into mind, so it’s very easy to work with him. He’s already halfway there. He knows where I’m headed in the sketches, so exploration is fun. Thumbnails. 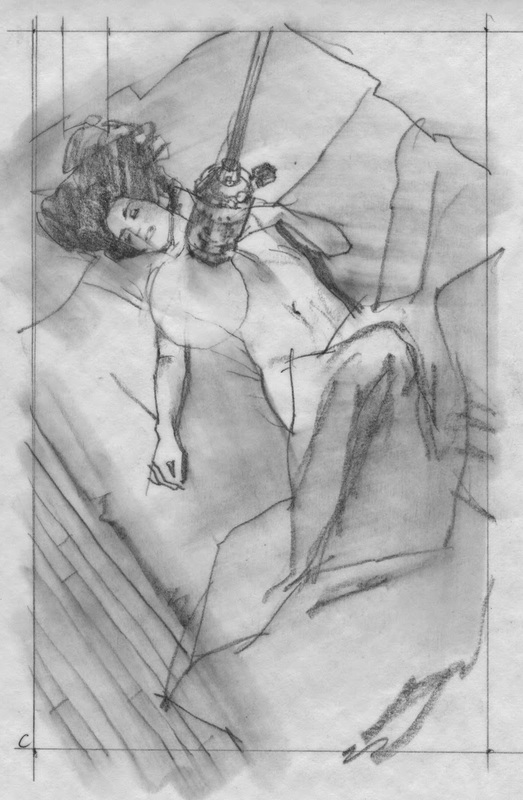 I started with the idea that we spy the scene from just below the surface of the bed, allowing me to raise the figure up from the sheets, signaling the viewer that she has just awoken and is, in fact, alive. I wanted to telegraph ‘alive’ as much as I could. Exploring for angles in my thumbnails, I moved around the bedroom in my head looking for alternate perspectives. When I found myself at the ceiling looking down at the scene, I thought it might be nice to see her stretched out. That’s when the light came on. Figuratively. Maybe it’s a dingy hotel room, and there’s a bare lightbulb dangling overhead. I can use the bulb on a cord to cover her nakedness ever so slightly, and use the sheets to cover the rest of her. I tried a study and continued on with other ideas, thinking Charles would laugh about that one, but not be interested. I met with Charles in NYC, and that was the idea he responded to the most. It read well, but he wondered if I could pull it off. 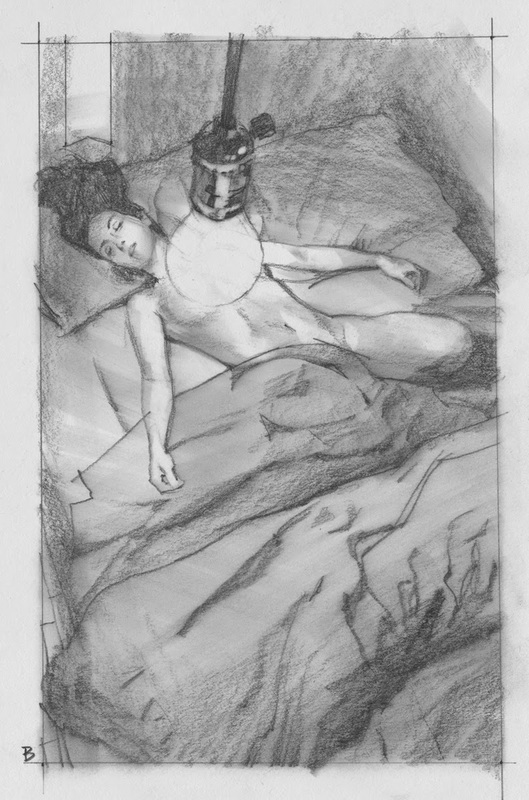 I told him it would come down to how I posed the figure and the angle on the bulb. I bought a light fixture at a local hardware store, lit and shot it for reference, then combined them together into the finish pencils. I drew several so that Charles would have a choice, and he could help me make a decision about the right pose for the strongest cover. 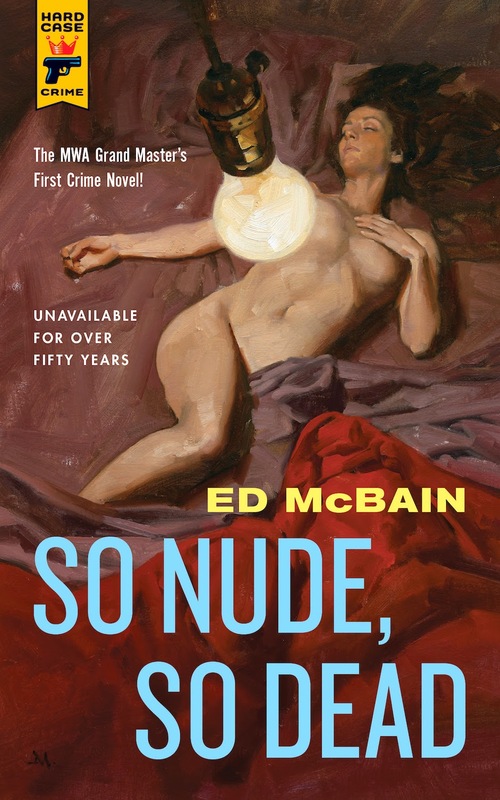 There was type to consider, of course, and I decided to use darker bed sheets so her skin would contrast on the cover, as well as the reversed type. It had to read very fast. I got the ‘go ahead’ with no changes. There were a few minor adjustments to the final piece, just a couple of tweaks, but ultimately, the cover allows the viewer to wonder: dead or alive?